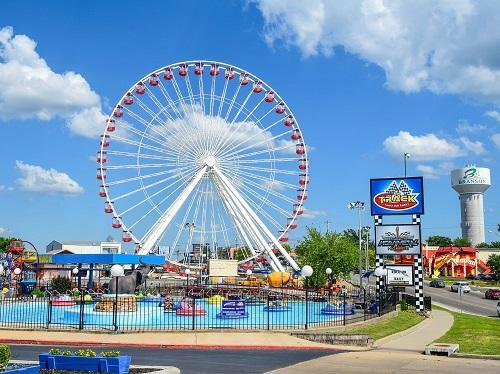 It took 26 semi-trucks and $4 million to get the former Navy Pier Ferris Wheel from Chicago to Branson. It stood on the Navy Pier for 20 years before being sold for $2 million. Chicago’s Navy Pier Ferris Wheel opened on July 1, 1995 and was replaced by a larger wheel in 2015. Employees of Dutch Wheels, the original builders, were flown to Branson to reassemble the massive structure. Renamed the Branson Ferris Wheel, it opened with much fanfare on June 23rd at the Track Family Fun Park on West Highway 76. 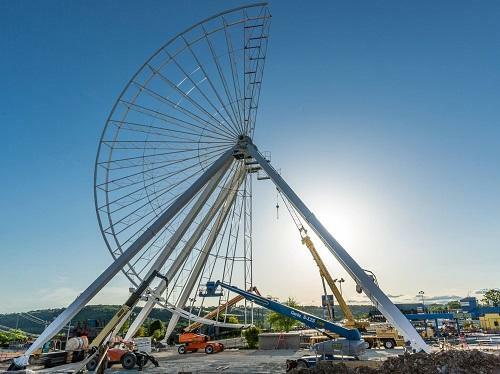 The 150-foot wheel has 40 spokes and 40 gondolas to carry up to 240 passengers and weighs in at a whopping 450,000 pounds. The foundation includes over 4 million pounds of concrete, over 6 million pounds of gravel and 80,000 pounds of steel, with piers driven 23 feet into the rock underneath. At 15 stories tall, you’ll have the best view of the Ozarks and the entertainment corridor in Branson. The original Ferris Wheel was designed by George Washington Gale Ferris, Jr. in June 1893 for the World’s Columbian Exposition in Chicago. According to the Smithsonian, it was to be the States architectural and engineering response to the recently erected Eiffel Tower. The original wheel had 36 passenger cars able to accommodate 60 people each. It was 264 feet tall and was illuminated by 2,500 Edison incandescent lamps. ExploreBranson.com has added the Ferris Wheel to its list of Branson Selfie Stars where you’ll find best spots in Branson to stop and snap a selfie to share on your social media channels. Every night at 9:00 p.m., 10:00 p.m., and 10:55 p.m. the Branson Ferris Wheel presents ELECTRIFY: A Music & Light Spectacular. The Wheel has 16,000 LED fixtures with more than 144,000 individual lights, each computer-controlled and programmed by Branson’s very own Michael Haygood who is responsible for the special effects, pyrotechnics and laser display for his musical family, The Haygoods. Play the video below for a sneak peak of ELECTRIFY. The ride costs $12 for adults and $8 for kids 11 and under. Kids 3 and under ride free. Make sure to add Branson’s newest attraction to your itinerary during your next vacation. For more information on the Branson Ferris Wheel and The Track Family Fun Parks, visit their website.